The local Utah media is finally reporting on this building. Several of my photos from this site were on a KUTV News story covering the building this evening. Here is the short news clip. Ward organized Nov 21, 1930. First met in a house that served as a seminary building. After two months, the ward cleaned up an entertainment and dance hall called the ‘Old Barn’, a 32×65 foot frame building built in 1894, and met here for 3 ½ years. With a $50,000 budget, the architecture firm of Hodgson & McClenahan was hired in 1931 to draw plans for a site on Jefferson and 10th. (This firm also designed the Ogden High School and Ogden Municipal building, buildings that were also in the Art Deco style.) The site was 165’ frontage and 185’ depth. A Sunday School program was set up where everyone could buy a ‘gold brick’ for 5 cents that was made of gold construction paper with ‘5 cents’ written on it. In June 1933 the basement of the Recreation hall began construction. Ward members could work if they had little cash to contribute. During the Great Depression, half of the ward was out of work. Bricks were used from the demolished ‘Virginia Building’ as the inside layer of brick for the walls. A great deal of time was spent hauling the bricks to the site and cleaning off the old mortar. Although far from complete, in August of 1934 the first meeting was held in the Recreation hall. By July 1940, enough funds had been raised to construct the entire front unit consisting of the Chapel, kitchen and scout room. Concrete pours for the foundation of this front unit were done in three night shifts: the High Priests & Aaronic Priesthood had the first shift, the Elders the second shift, and the 70’s the third shift. The second shift finished about 4:00am and the third shift wrapped up about 7:30am. 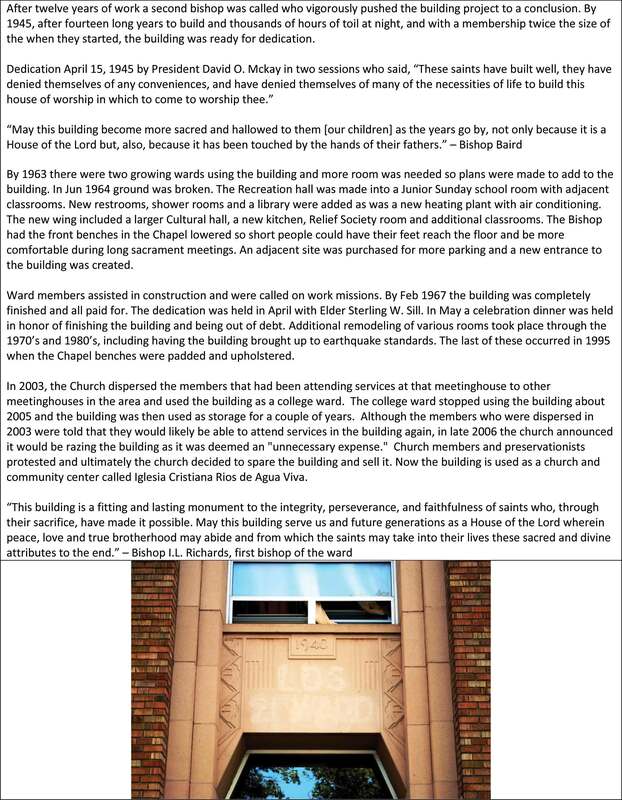 After twelve years of work a second bishop was called who vigorously pushed the building project to a conclusion. By 1945, after fourteen long years to build and thousands of hours of toil at night, and with a membership twice the size of the when they started, the building was ready for dedication. By 1963 there were two growing wards using the building and more room was needed so plans were made to add to the building. In Jun 1964 ground was broken. The Recreation hall was made into a Junior Sunday school room with adjacent classrooms. New restrooms, shower rooms and a library were added as was a new heating plant with air conditioning. The new wing included a larger Cultural hall, a new kitchen, Relief Society room and additional classrooms. The Bishop had the front benches in the Chapel lowered so short people could have their feet reach the floor and be more comfortable during long sacrament meetings. An adjacent site was purchased for more parking and a new entrance to the building was created. 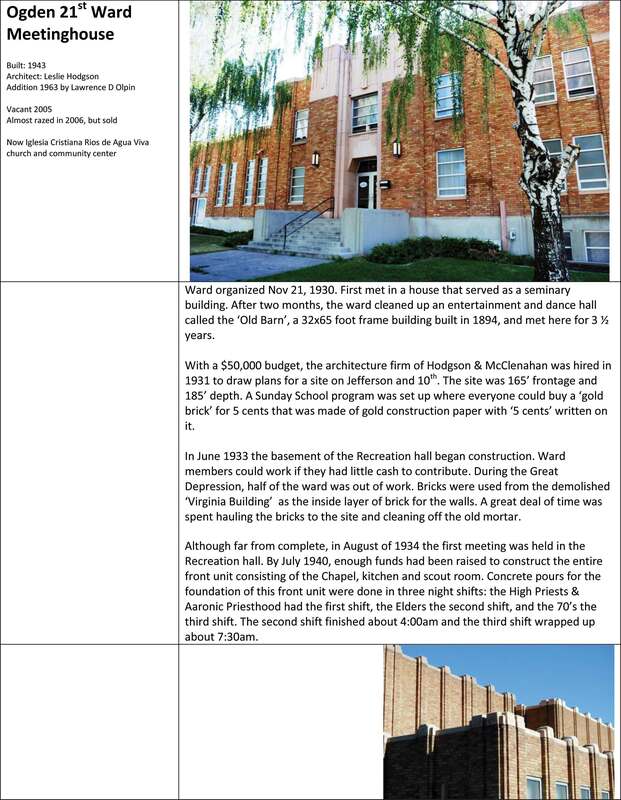 Ward members assisted in construction and were called on work missions. By Feb 1967 the building was completely finished and all paid for. The dedication was held in April with Elder Sterling W. Sill. In May a celebration dinner was held in honor of finishing the building and being out of debt. Additional remodeling of various rooms took place through the 1970’s and 1980’s, including having the building brought up to earthquake standards. The last of these occurred in 1995 when the Chapel benches were padded and upholstered. In 2003, the Church dispersed the members that had been attending services at that meetinghouse to other meetinghouses in the area and used the building as a college ward. The college ward stopped using the building about 2005 and the building was then used as storage for a couple of years. Although the members who were dispersed in 2003 were told that they would likely be able to attend services in the building again, in late 2006 the church announced it would be razing the building as it was deemed an “unnecessary expense.” Church members and preservationists protested and ultimately the church decided to spare the building and sell it. Now the building is used as a church and community center called Iglesia Cristiana Rios de Agua Viva. *A huge thanks to dstringham for a large portion of this research and for the photo of the chapel interior. The Ogden Deaf Branch (formerly the “L.D.S. Branch for the Deaf,” which it was called until the 1940s and is still on the identification plaque on the front wall of the building, lower left) met in this building until January 1999. Petition was made to the First Presidency in 1911/1912 to construct the building at a cost of $15,000; well-known Prairie School architect Leslie Hodgson was contracted to design the building. Construction on the building began in 1915 following the First Presidency’s approval in January and was completed in December 1916/January 1917. The building was dedicated 14 January 1917 by President Joseph F. Smith and attended by Anthon H. Lund and several Church apostles. On 4 February 1917, the L.D.S. 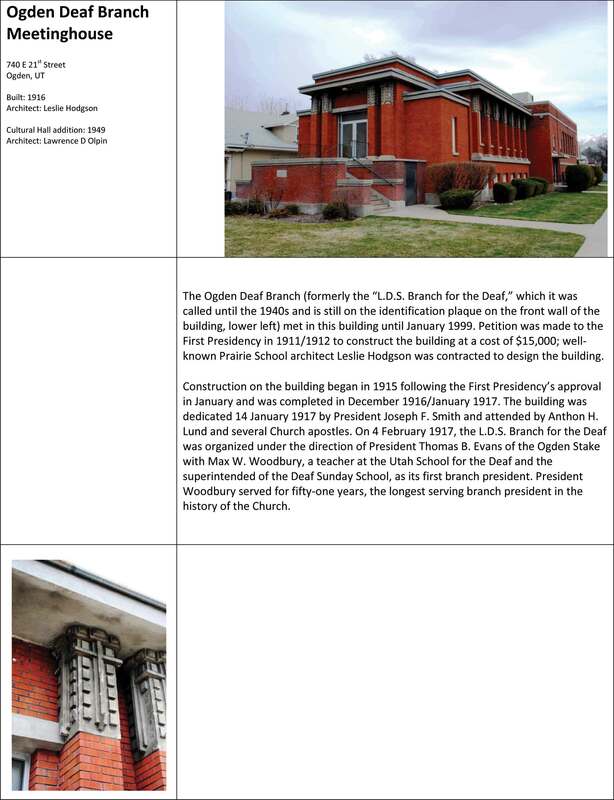 Branch for the Deaf was organized under the direction of President Thomas B. Evans of the Ogden Stake with Max W. Woodbury, a teacher at the Utah School for the Deaf and the superintended of the Deaf Sunday School, as its first branch president. President Woodbury served for fifty-one years, the longest serving branch president in the history of the Church. The rostrum and elevation of the chapel are uniquely designed to leverage the visual needs of Deaf congregants. The floor is sloped to allow successive rows to see the speaker and the pulpit is situated in the middle of the rostrum with seating to the sides (but not behind) of the pulpit to enable leaders to view the signing of speakers. The basement classrooms were all designed to have light switches both inside (to control interior lighting) and outside (to signal students) of the rooms. The building is located a block and half southwest of the (old) campus of the Utah School for the Deaf. When the School relocated to Ogden in 1896, Deaf students and local Deaf parishioners attended Sunday School services in the Ogden Fourth Ward gymnasium—rain, shine, and cold—until 1917. Plans for an addition to extend the Deaf Branch building to the north were accepted in February 1948 at a cost of $26,500, ground broken in October 1949, completed sometime in Autumn 1950, and dedicated by Presiding Bishop LeGrand Richards on 9 Dec 1951. 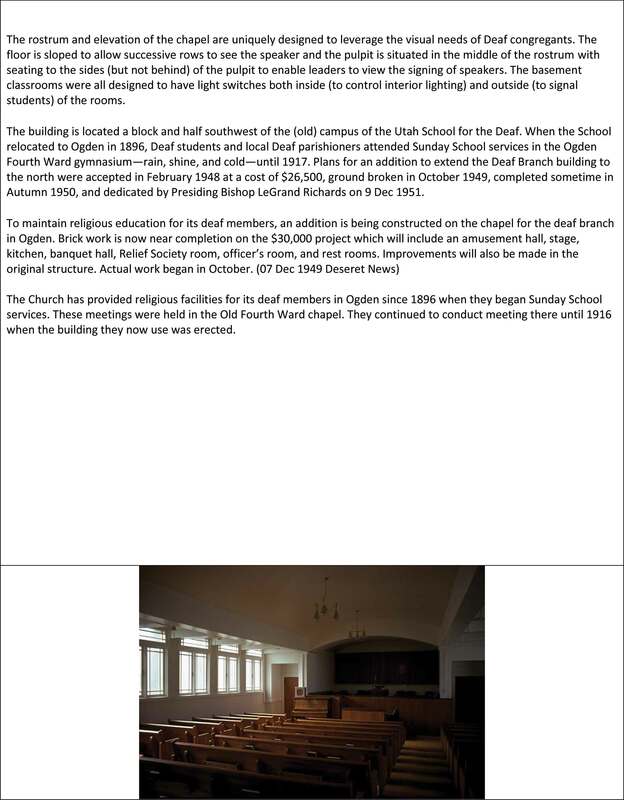 The Church has provided religious facilities for its deaf members in Ogden since 1896 when they began Sunday School services. These meetings were held in the Old Fourth Ward chapel. They continued to conduct meeting there until 1916 when the building they now use was erected.